The site is dominated by two broad ridges, one at the clubhouse and one in the middle of the front nine with an old stone water tower base that stands guard over the property. The holes are arranged creatively to work up, down, along, and astride these ridges in myriad ways that are constantly changing and fresh. The land is undulating but not too severe and the rhythm of the routing makes for a very pleasant walking course. Most of the greens on the course were flattened after WWII and were in need of interest. We rebuilt all the greens to modern specs and provided them with contour and character consistent with the Golden Age courses. 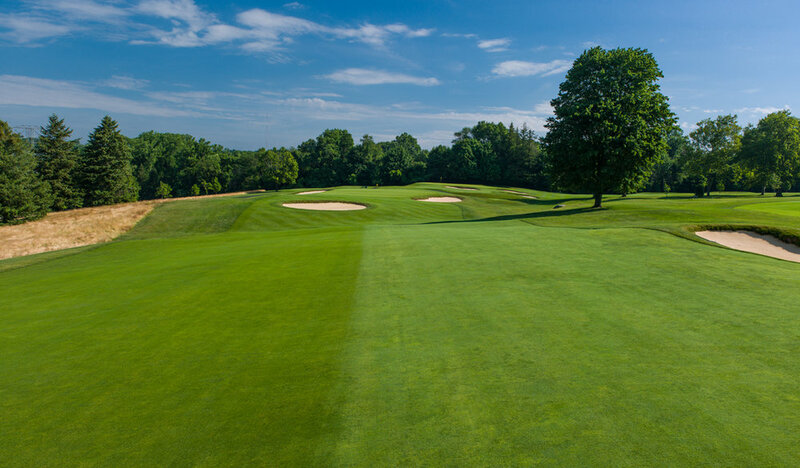 The final three holes had been modified when a pool was built on the old #18 greensite in 1931, so a re-routing of the last three holes has led to a rousing finish to the course with a long par 5 sixteenth to a green on a ridge, a short bunkerless par three at #17, and a stiff par four 18th hole that will reward creative, measured play on the final hole. This project is very unique, in that I first visited the course in 2004 but the economic downturn of 2008 put things on hold until it could be finished in 2016. Patience is a virtue, though, and what a great course Sunningdale Country Club has to enjoy for many years to come.